There are so many events leading up to, during the death of Jesus and in His resurrection which are bursting with revelation. The Son of Man, and Son of God – Jesus – came for a purpose, and that purpose was found at the cross. Here are just ten moments to meditate upon. 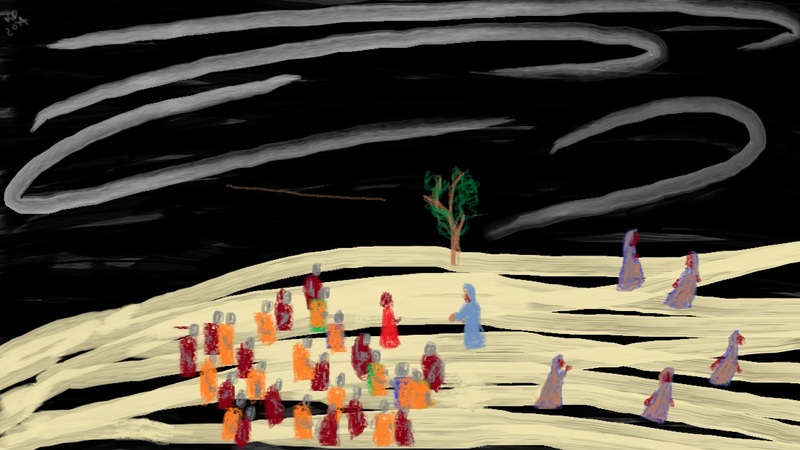 Notes: Jesus’ last parables to the crowd gave a strong message – “Keep watch, be prepared for the day of the Lord” Yet, His disciples took some time to recognise the significance of His death, and the leaders of the people were offended by Jesus’ words. 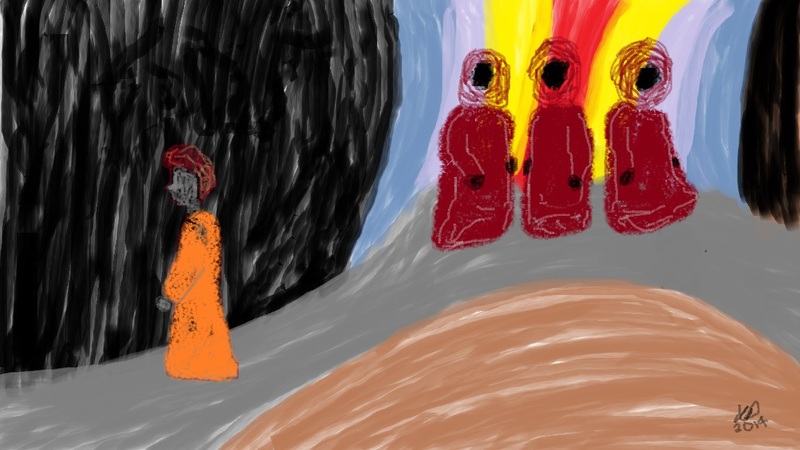 The religious divisions – Pharisees, Sadducees and Scribes united together to plot against Jesus’ life. Their means was trickery as they had no weapon against His words of truth. Yet, even in their zeal to kill Jesus, they waited until after the Passover in order to ensure the people would not rebel. Jesus looked heavenward in selflessness, but his enemies, in selfishness, looked for man’s praise. Notes: 30 pieces of silver was the price of compensation for an injured male or female slave who was gored by an ox (Exodus 21:32) In addition, the ox was to be stoned. This was the price at which Judas judged Jesus’ well-being. Jesus became a servant to man, yet He was despised, and afflicted by man. Despite this, Jesus overcame the grave to provide life to all who would believe in Him. He paid the greatest compensation of all – the price of redemption from sin. Gethsemane – or literally “oil/olive press” – this was the place where Jesus was tested as His time drew near. Even with the weight of His sorrow and deep distress, knowing that the sin of the world would be laid upon Him, He cried out to God – “O My Father, if it is possible, let this cup pass from Me; nevertheless, not as I will, but as You will.” And a second time, “O My Father, if this cup cannot pass away from Me unless I drink I, Your will be done.” With this submission to God’s will and obedience to His way, the olive yielded and the oil was produced. Jesus was alone in this. While, He had taken Peter, James and John with Him, they fell asleep on multiple occasions. Jesus’ words to them were both strong, urgent and gentle – He spoke in love as He urged them to “watch and pray”. Notes: Olives were a significant part of Israel’s economy. It was also used extensively by the people for food, lighting lamps and anointing. The gethsemane (oil press) and mill used in the processing of olives were mostly owned by the wealthy as they were large and expensive. Yet, many people paid the price required to process their olives with the fruit being such an important part of Israel’s economic society. Matthew 26:47 describes how Judas appeared, a “great multitude with swords and clubs, … from the chief priests and elders of the people”, coming with him. Jesus knew, but his disciples still had not fully grasped his words – imagine their thoughts upon seeing a good friend leading such a group towards them! Moreover, Judas’ sign of betrayal is a kiss and a greeting – “Greetings, Rabbi!” What an insult – Judas’ actions and words are not sincere and Jesus see this. He calls him “friend” (Greek: hertairos) identifying Judas as an imposter. The Greek “hetaros” refers to an imposter who acts as a companion, but with his own interests in mind. The gospel of John describes how Simon Peter, who also had a sword, struck off the right ear of the High Priest’s servant. Luke describes how Jesus touched the man’s ear and healed him. He explains again, that this is the appointed time of his suffering – “…Shall I not drink the cup which My Father has given Me?” [John 18:11], “When I was with you daily in the temple, you did not try to seize Me. But this is your hour, and the power of darkness.” [Luke 22:53] “Or do you think that I cannot now pray to My Father, and He will provide Me with more than twelve legions of angels? How then could the Scriptures be fulfilled, that it must happen thus?” [Matthew 26:53-54] Then, Jesus is abandoned as those around them flee. Notes: Jesus gives so much revelation in this short moment! He tells Peter to sheath His sword because God’s victory in Christ at the cross was as the Lamb, and not the Lion. Jesus was led as a sheep to the slaughter, silent before His accusers and there, at the cross, He overcame sin and death to make a new way. His humility, His obedience became our victory. “But thanks be to God, who gives us victory through our Lord Jesus Christ.” [1 Corinthians 15:57] When Judas greets and betrays Him, Jesus could have accused, condemned or destroyed him. Yet, He says, “Friend, why have you come?” Of course Jesus knows why he has come, but he calls Judas “imposter” and challenges Judas – what is the focus of your heart? Many people profess to love Jesus, but their hearts are far away from Him and He sees it. Jesus heals the ear of His enemy’s servant, showing His mercy and His lovingkindness even while being ambushed by His enemies. What testimony He gave to this servant, at that moment. As His enemies surround Him, and His disciples are bewildered, Jesus clarifies His purpose in all this – He is here to complete His Father’s will, to drink the cup of God’s wrath in the place of man. All this was not by chance, but according to the timing of the Father in heaven. It is reminiscent of His time of temptation in the desert. Jesus refused to compromise when tempted by comforts – food, water, power. He was focused on doing the Father’s will, even if that meant a period of suffering. He prepared Himself for the cross and He did not lose sight of this goal. Being equal with God, He still came in the likeness of man, and made Himself obedient even to death on a cross. 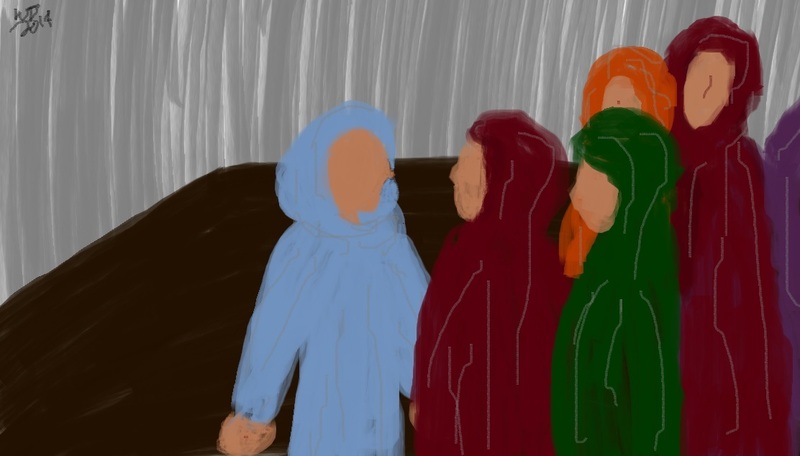 Jesus was presented before the Sanhedrin, Pilate and Herod. The Sanhedrin brought false witnesses against Him, but their testimonies did not stand because they all disagreed with each other. Silent until directly asked if He is the Christ, Jesus identifies their single-minded heart – “If I tell you, you will by no means believe. And if I also ask you, you will by no means let me go. Hereafter the Son of Man will sit on the right hand of the power of God.” [Luke 22:67-69] So those present began to persecute him – they spat on him, blindfolded Him, beat Him, jeered at Him saying, “Prophesy!” and struck Him with their hands. Jesus was then brought before Pontius Pilate, the fifth prefect of the Roman Province Judea. He served under the Roman Emperor Tiberius. Pilate found no fault in Jesus and marveled at how He remained silent before His many accusers. Jesus was then brought before Herod, being also of his jurisdiction as a man from Galilee. Herod’s disposition changed greatly from gladness at seeing Jesus, hoping He would perform a miracle, to contempt at Jesus’ refusal to answer His questions. 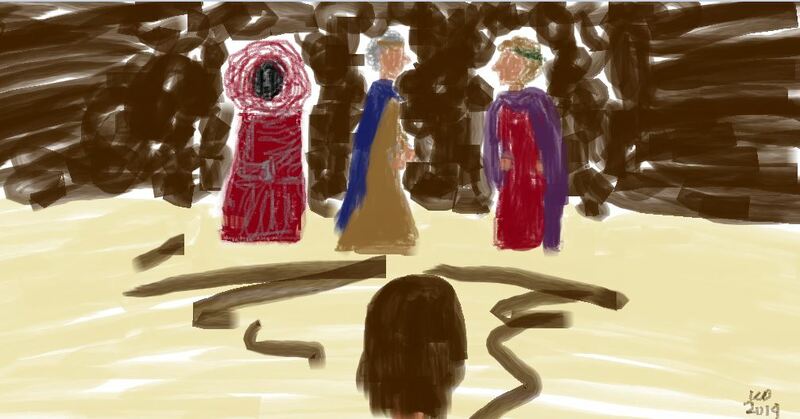 Pilate and Herod then become friends when they had previously been enemies. Notes: At this time, Jerusalem and the Jews were under Roman reign. Interestingly, both Pilate and Herod were intrigued by Jesus. Pilate wondered at His silence before his accusers, and Herod was curious about the signs and wonders He was supposed to have done. Jesus could have acted differently – had He answered Herod’s curious questions, He might have won the favour of this influential man. Yet, Jesus sought the praise of His Heavenly Father, and not men. He looked at the heart and Herod’s was seeking the wrong thing. 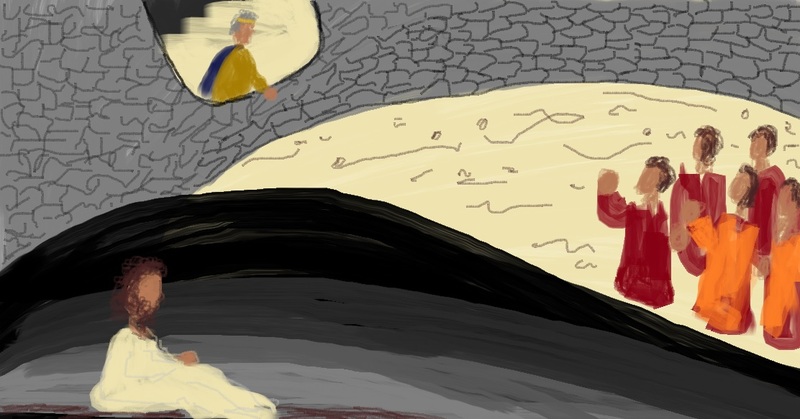 Barabbas, a rebel and murderer lay imprisoned while Pilate spoke to the Jews about releasing a prisoner, as was the custom for the time of the Passover feast. As the Scriptures tell the story, Barabbas is released and Jesus is condemned to die and be crucified. 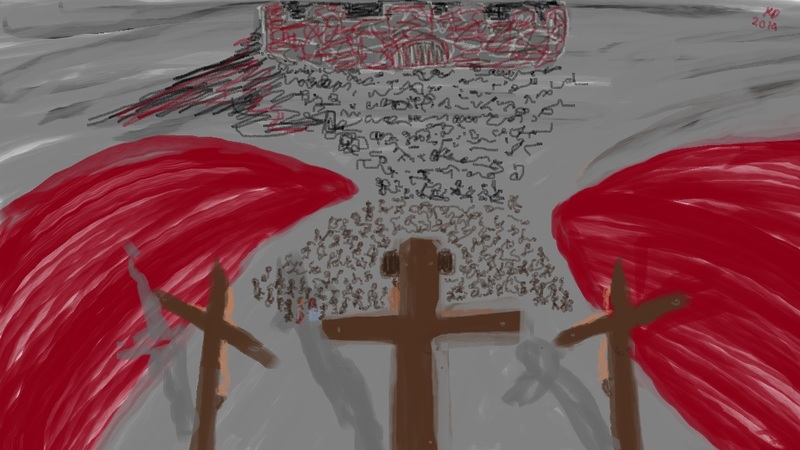 Note: I remember something my Dad mentioned once – imagine Barabbas listening to the cries of the people, first “Barabbas, Barabbas!”, then “Crucify him!” Yet, when the guards come to get him, Barabbas is led out into freedom. Barabbas is the only person whose place Jesus literally took in death. Notes: At so many points during His life, Jesus could have taken the easy route out. Yet, He stood so strongly, and humbly, in the face of opposition, persecution and suffering. He demonstrated what it means to be set apart in holiness in His knowing when to say no, and even to the very end, He was forgiving people. It is also interesting to see what happens immediately after His death – the veil to the Holy of Holies is torn as He made it possible for all people to have intimate relationship with God, there is an earthquake and the dead are raised to life. When Jesus returns, these things will happen again, but at a much larger scale! 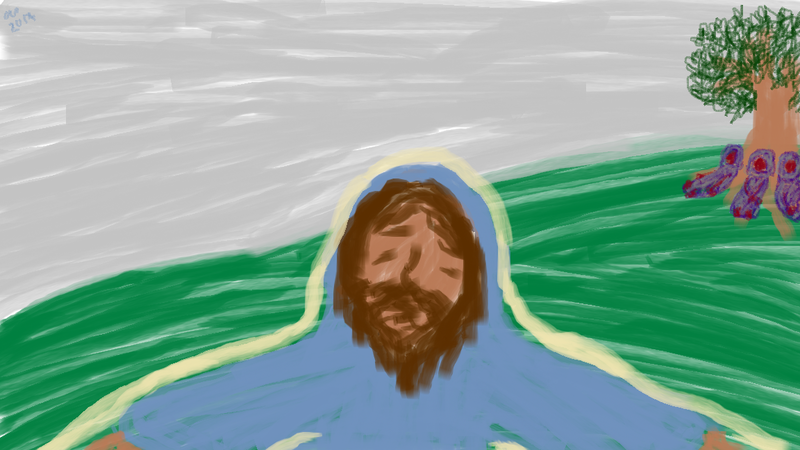 Notes: What a privilege to be the first person to see the risen Christ! At the same time, Mary Magdalene could have been mocked – after all, the story of someone coming back from the grave is quite unusual. However, Jesus did indeed rise from the grave and He explained the resurrection to Mary, saying He would be going to His Father, the same Father and the same God of His people. Jesus had actually explained this to His disciples before His death, but it seems they had not grasped its full meaning and they seemed surprised by His resurrection. He says, in John 14:2-4, “In My Father’s house are many mansions; if it were not so, I would have told you. I go to prepare a place for you. And if I go and prepare a place for you, I will come again and receive you to Myself; that where I am, there you may be also. And where I go you know, and the way you know.” Jesus made a way for sinful man to again enter the presence of God and abide with the Heavenly Father in intimacy. Mary, sincere in her concern for Jesus’ body, and her love for Him, believed in the resurrected Christ. He called her name, and she recognised Him. Peter’s observation of the facial handkerchief, folded separately from the other grave clothes has resulted in multiple interpretations of its meaning. It makes sense that robbers would not have bothered taking the time to unwrap the body of Jesus. How they could also have rolled away the stone and bypassed the guards as well makes the story even more unlikely. Jesus was resurrected and has victory over the grave! 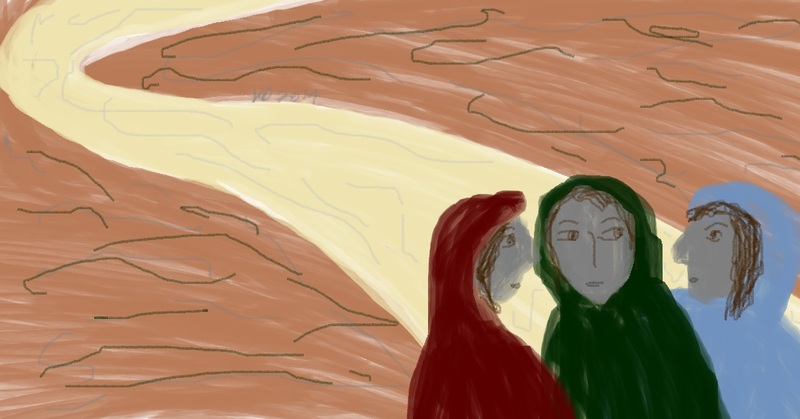 Two disciples, one of whom was named Cleopas, were walking from Jerusalem to Emmaus when they met someone on the road. The stranger did not seem to know what had recently happened in Jerusalem so Cleopas filled Him in – “The things concerning Jesus of Nazareth, who was a Prophet mighty in deed and word before God and all the people, and how the chief priests and our rulers delivered Him to be condemned to death, and crucified Him. But we were hoping that it was He who was going to redeem Israel. Indeed, besides all this, today is the third day since all these things happened. Yes, and certain women of our company, who arrive at the tomb early, astonished us. When they did not find His body, they came saying that had also seen a vision of angels who said He was alive. And certain of those who were with us went to the tomb and found it just as the women had said; but Him they did not see.” Jesus then replies to them, explaining the Scriptures about Himself. He says to them, “Ought not the Christ to have suffered these things and to enter into His glory?” He stays until evening, sits with them, takes bread, blesses it, breaks it and gives it to them. Then, the eyes of the men are opened and they recognise Jesus. At that moment, He disappears from their sight, but they immediately rise and find the disciples to tell them that Christ had risen. 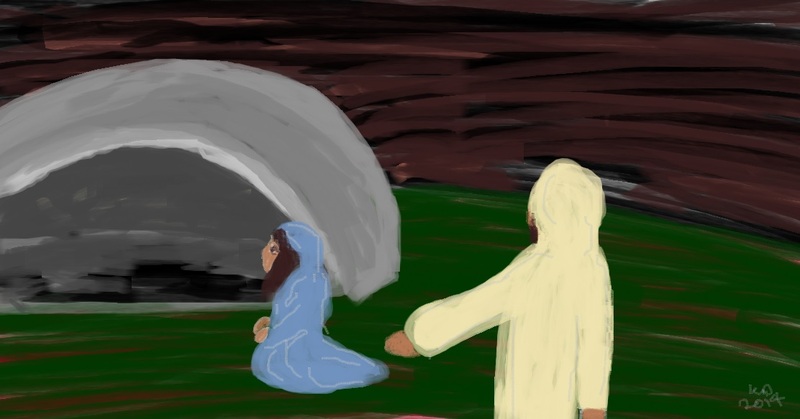 Notes: With both Mary and these disciples, Jesus waits to reveal Himself. He asks them questions and they reveal the position of their hearts. Then, Jesus reveals Himself, again explaining to them His purpose. It takes faith and courage for these disciples to tells others of His resurrection, but neither these disciples, nor Mary tarry. No, they go immediately to tell the good news to others and they believe in Jesus, in the power of His resurrection. Notes: Again, Jesus gives evidence of His resurrection. He had flesh and bone, He eats and He speaks the word of truth. As His dumbfounded disciples comprehend the significance of what has happened, Jesus gives them, and with them all believers, a commission – preach the gospel to all, that through Jesus Christ, all sins are forgiven that man may be reunited with God. Thank you for your columns. God bless! 🙂 You too! Just want people to be encouraged in the Lord!